While boxed game releases used to mean one large payment for one large game, that idea isn’t a certainty any more. Episodic games often occupy the midpoint of the price-content spectrum, while some AAA games aim for everywhere on the spectrum at once; a full game for a full price, a season pass on top, then microtransactions on top of that. For AAA games, microtransactions rely on keeping the momentum of playtime going- for longer, either by unlocking new items early, or by increasing rewards. However, major freemium games instead aim for “micro-gaming”- limiting people to short, regular chunks of gameplay. Transactions can act as micro-monetisation -exchanging a little bit of money for a little bit of time saved. One explanation for this is simple; many freemium games are designed for mobile play, and smaller devices with often-unpredictable battery life aren’t the best option for someone settling down for a long gaming session. Many are designed to be played by people unused to gaming, who may not want to play for long periods of time. While those are both good points, there are psychological factors at play. Repetition is a major factor in learning, and also in habit formation. So if Person A learns a new skill for 8 hours one day, then leaves it for a week, they will remember less than Person B who learned for an hour a day. Similarly, if Person C plays a game in sporadic mammoth sessions, it will take longer for playing to become a habit than for Person D who plays 5 minutes every day. As a bonus for sponsors, being exposed to the game every day also means regular exposure to adverts and calls for microtransactions, which increases the likelihood of someone being tempted to buy their way to progress. So, how does a developer design a game for that kind of bite-size daily hit? One method is to add a bonus for resting, such as Nintendo’s 3DS Streetpass, or the resting XP collection mechanic in The World Ends With You. This idea is mostly used in console gaming. Another option, especially in mobile gaming, is to set limits on the amount of activity players can do in one day. These limits are often set by an Energy meter in mobile games, or an action limit in browser-based games. The aim of setting limits is for players to feel slightly frustrated as they can’t complete everything in one go. Remember the Ziegarnik effect? Remembering unfinished tasks will make players more likely to desire returning the next day to finish. In order for this system to work well the amount of activities available each day needs to be enough for a sense of progress or reward to kick in, but not enough for the player to feel like they have done all they want. How and when the player’s energy refills is another important element. Energy that is too harshly depleted will put people off, as will energy that takes too long to refill. Contrarily, energy that refills on too short a time cycle will be seen as too much of a psychological burden, and may be ignored. A game I’ve mentioned in this series before, Mafia City, uses a 100-point energy bar which equates to 25 actions. Once fully depleted, energy restores gradually, a bar every few minutes. This timing system works relatively well, as the cycle of energy fill-depletion-refill isn’t too extended or too short. 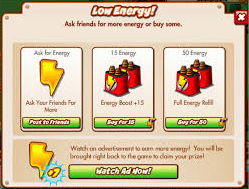 Players can also buy an energy refill consumable with Gold (the game’s hard currency). This option of buying “one more cycle” with a small amount of real currency exemplifies the microgaming concept I mentioned: it’s a way of adding microtransactions that meshes with the playstyle of casual gaming. It also means the player is more likely to be back the next day, as they want to continue getting what they paid for, investing even more into the habit. The Psychology of Freemium Gaming: Gates, Walls and Curves.